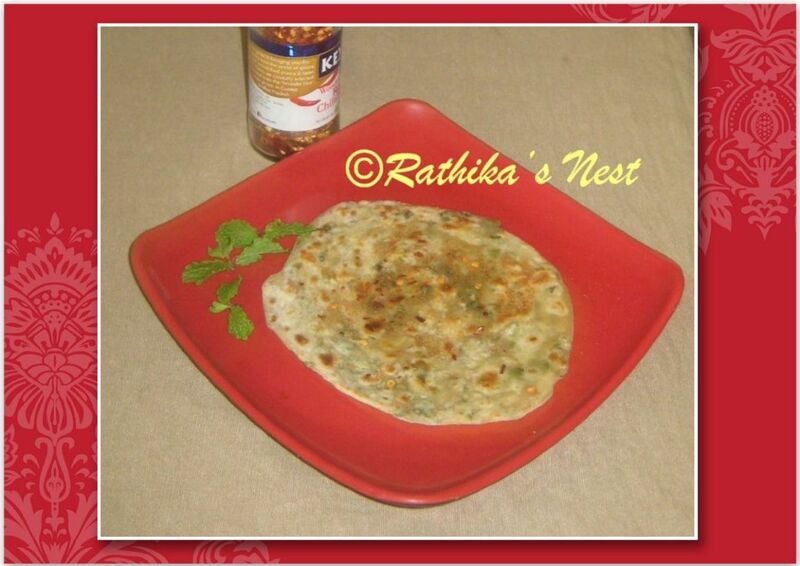 You can make different types of parathas and I have already shared a few paratha recipes on Rathika's Nest. Mint leaves have unique flavor and high nutritive value containing vitamins, dietary fiber, anti-oxidants and minerals. Mint paratha is easy-to-make and adds a welcome change to your lunch or dinner. Let's start the preparation. Method - How to make the dough: Separate the mint leaves from the stalks and wash them 2-3 times in running water. Drain fully. Combine wheat flour, all purpose flour and salt in a bowl. Add mint leaves and sour curds; mix well. Knead with required water to make a firm dough. Cover the bowl with a wet cloth and let the dough stand for 15-20 minutes. How to make the paratha: Divide the dough into 8 equal parts and shape them into balls. Dust the board with flour and roll a dough ball into a chapatti of approximately 6" in diameter, dusting with flour as needed (Figure 1). Fold the chapatti like a fan as shown in Figure 2. Fold one edge of the fan inwards and roll the folded chapatti into a small cylinder (Figure 3). 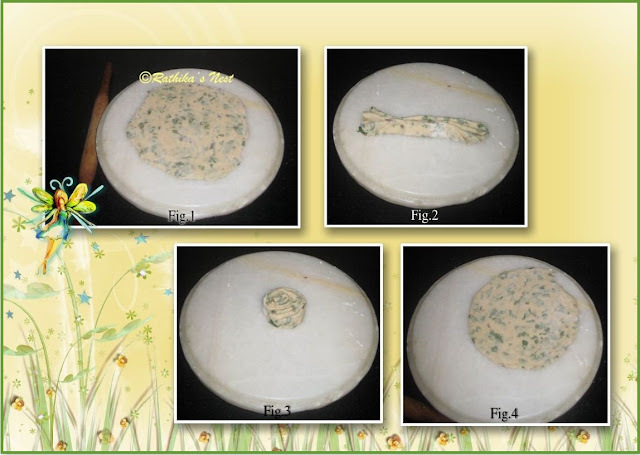 Gently flatten it with your palm, dust with flour and roll again into a paratha of 6-7" in diameter (Figure 4). Roll out the remaining dough balls in the same way. Fig.4: Flatten the cylinder and roll it into a paratha. Heat a tava on medium flame. Place the rolled out paratha on the tava. Smear ½ teaspoon ghee on the surface and turn it over. Apply ghee on the other side. Cook till the paratha is done and brown spots appear on both sides. Remove from the tava. Cook the remaining parathas in the same way. Sprinkle roasted cumin powder and chilli flakes on the parathas. Serve hot with curry or gravy and a salad. You can also simply serve this paratha with fresh curds and pickle!